In March this year Affan Innovative Structures were invited by Al Futaim Carillion to assist in coming up with a proposal to an usual construction problem. Construction works are ongoing at the new Al Jalila Childrens Hospital in Dubai. 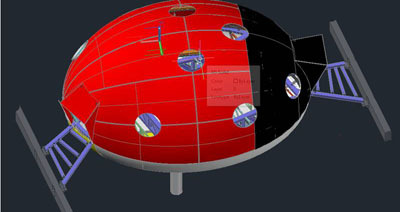 The centerpiece of the new atrium is a 2 storey high “ladybug”. 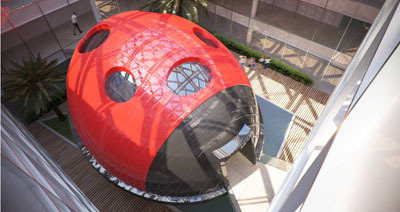 In reality “Ladybug” is an unusually designed media center to be used by the children, but created in the shape of a giant ladybug. Affan Innovative Structures were asked to look at constructing a seamless double curved shell complete with skylights and wing effects. 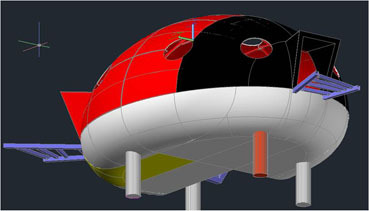 The 3D design was presented and approved in April and the problem of the seamless shell solved by the use of Affan’s advanced engineering and use of structural composite to create a 2 hour fire retardant seamless structure. The shell construction commenced on Site in May and works are due to complete by the end of July.